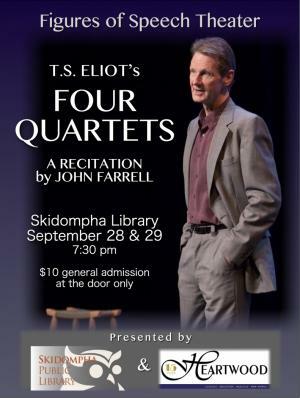 John Farrell, principal in Maine’s groundbreaking Figures of Speech Theatre, recites from memory Four Quartets, a suite of poems often considered T.S. Eliot’s greatest, at Skidompha Library. An informal conversation with John Farrell will follow. Part of Figures of Speech Theatre’s 2018 Maine Library Tour, this recitation is presented by Heartwood in collaboration with Skidompha Library.